Research at the Center for Computational Relativity and Gravitation at Rochester Institute of Technology explores extreme astrophysical phenomena through Albert Einstein’s general theory of relativity. Several members of the center contributed research to the LIGO Scientific Collaboration that helped confirm Einstein’s prediction of the existence of gravitational waves. Members of the center include, left to right in the front row, Jam Sadiq, John Whelan, Jason Nordhaus, Monica Rizzo, Carlos Lousto and Manuela Campanelli, director; in the second row, Joshua Faber, Brennan Ireland and Naixin (Chris) Kang; in the third row, Yosef Zlochower, Yuanhao (Harry) Zhang and Richard O’Shaughnessy; in the fourth row, Dennis Bowen and Jake Lange; and in the fifth row, Zachary Silberman, Hans-Peter Bischof and James Healy. 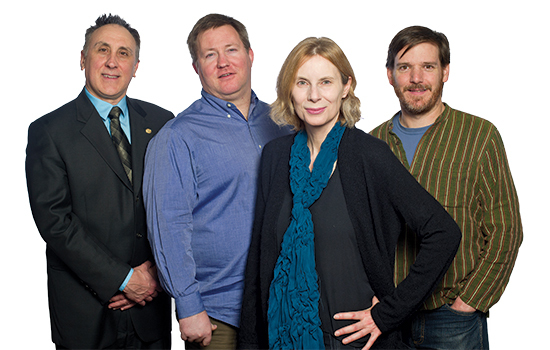 The gravitational wave team, which includes members of the LIGO Scientific team, in RIT’s Center for Computational Relativity and Gravitation consists of faculty and students working together to explore numerical relativity and relativistic astrophysics, gravitational wave physics, high-performance computation and scientific visualization. Manuela Campanelli is CCRG director and a founding center member. Campanelli came to RIT in 2007 to run the center. A professor in the School of Mathematical Sciences and faculty in the astrophysical sciences and technology Ph.D. program in the College of Science, she is also a fellow of the American Physical Society. Campanelli received her Ph.D. in physics from the University of Bern in Switzerland and her research focuses on exploring binary black holes and gravitational waves, with a specialty in numerical relativity, a field that applies supercomputers to Einstein’s general theory of relativity. Her interests extend to gravitomagnetohydrodynamics and the study of black hole accretion and compact binary mergers, and gravitational core collapse. Campanelli was the lead author of the 2005 breakthrough research on binary black hole simulations. In 2007, she discovered that supermassive black holes can be ejected from most galaxies at speeds of up to 4000km/s. Campanelli is a member of the LIGO Scientific Collaboration, a group of researchers supporting the US-based LIGO gravitational wave detector. Hans-Peter Bischof, professor of computer science in the B. Thomas Golisano College of Computing and Information Sciences. Bischof is a founding member of the center, having received his Ph.D. in computer science at the University of Osnabrück in Germany. He works in scientific visualization, high-performance computing and language design, and his visualizations of numerical relativity simulations have appeared in science magazines and in the History Channel program, The Universe: Cosmic Holes. Bischof is a member of the LIGO Scientific Collaboration. Joshua Faber, associate professor in the School of Mathematical Sciences and faculty in the astrophysical sciences and technology Ph.D. program in the College of Science. Faber, who holds a Ph.D. in physics from the Massachusetts Institute of Technology, studies binary neutron stars and black hole-neutron star binaries. His research interests include high-performance computing, relativistic dynamics, and the simulation of hydrodynamical compact object binary mergers. Carlos Lousto, professor in the School of Mathematical Sciences and faculty in the astrophysical sciences and technology Ph.D. program in the College of Science. Lousto joined RIT in 2007 as a founding member of the center. He is a fellow of the American Physical Society and a member of the LIGO Scientific Collaboration. Lousto, who received a Ph.D. in astronomy from the University of La Plata and a Ph.D. in physics from the University of Buenos Aires, conducts research in numerical relativity, relativistic astrophysics, black hole physics and perturbation theory. Lousto and James Healy numerically modeled the merger of a pair of black holes and simulated the gravitational waveforms that match the ones LIGO detected for the first time. Lousto is also a key author of the 2005 breakthrough research on binary black hole simulations. His research discovered that supermassive black holes can be ejected from most galaxies at speeds of up to 5000km/s. He is also the designer of the NewHorizon and BlueSky supercomputer clusters at RIT to perform binary black hole simulations, and the Funes cluster at the University of Texas as Brownsville. Jason Nordhaus, assistant professor of physics at the National Technical Institute for the Deaf at RIT. A core faculty member at the center, Nordhaus focuses on the evolution and dynamics of magnetic fields in evolved stars, close binary interactions and core-collapse supernovae, another key source for LIGO. Nordhaus received his Ph.D. in physics and astronomy from the University of Rochester. He is fluent in American Sign Language (ASL) and works to expand opportunities for deaf and hard-of-hearing students in astrophysics. Richard O’Shaughnessy, assistant professor in the School of Mathematical Sciences and faculty in the astrophysical sciences and technology Ph.D. program in the College of Science. O’Shaughnessy joined the RIT faculty in 2014. He completed his Ph.D. at Caltech under Kip Thorne and has held postdoctoral fellowships with LIGO-affiliated groups at Northwestern University, Pennsylvania State University and the University of Wisconsin-Milwaukee. A member of the LIGO Scientific Collaboration, O’Shaughnessy’s research focuses on how to discover and interpret gravitational waves produced by merging compact binaries like black holes and neutron stars. He is interested in them as individual events, as a population of many events, identifying distinctive features, and in broader astrophysical context. O’Shaughnessy and collaborators have predicted that LIGO would detect binary black holes like GW150914 soon after Advanced LIGO began operation. O’Shaughnessy collaborates closely with CCRG colleagues to directly compare LIGO data and state-of-the-art simulations of Einstein’s theory of gravity. John Whelan, associate professor in the School of Mathematical Sciences and faculty in the astrophysical sciences and technology Ph.D. program in the College of Science. Whelan is the principal investigator of RIT’s group in the LIGO Scientific Collaboration. He came to RIT in 2008, expanding the CCRG’s activities into the field of gravitational wave data analysis. He holds a Ph.D. in physics from the University of California, Santa Barbara. He is a former chair of the LSC’s review committee for compact binary analysis and led the internal review of the first search for binary black hole inspiral, merger and ringdown. He develops and implements methods to search for gravitational waves and currently leads an effort targeting Scorpius X-1, one of the most promising sources of continuous gravitational waves for advanced LIGO. Yosef Zlochower, associate professor in the School of Mathematical Sciences and faculty in the astrophysical sciences and technology Ph.D. program in the College of Science. Zlochower is a key author of the 2005 breakthrough research on binary black holes and a founding member of the center. His work focuses on numerical evolutions of multiple black hole spacetimes. He studies black hole dynamics, including recoils, spin and orbital precession, spin flips and generating waveform templates for LIGO data analysis. Zlochower, who holds a Ph.D. from the University of Pittsburgh, is also one of the developers of the implementation of the Pitt Null Code within the EinsteinToolkit. He received a Ph.D. in physics from Pennsylvania State University. Healy works closely with Carlos Lousto at the center. They numerically modeled the merger of a pair of black holes and simulated the gravitational waveforms that match the ones LIGO detected for the first time. Dennis Bowen, Ph.D. student in the astrophysical sciences and technology program in the College of Science. Bowen works with his mentor Manuela Campanelli and Scott Noble in strong field simulations of astrophysical systems like supermassive binary black holes and their accretion disks. His work at the center focuses on general relativity, viscous hydrodynamics and magnetohydrodymanics. Jackson Henry, undergraduate student in physics in the College of Science. Henry works with John Whelan in the center to study the detection geometry of LIGO. Brennan Ireland, Ph.D. student in the astrophysical sciences and technology program in the College of Science. Ireland works with his mentor Manuela Campanelli to simulate spinning black holes. His research focuses on analytical relativity and gravitational waves. Jake Lange, Ph.D. student in the astrophysical sciences and technology program in the College of Science. Lange works with Richard O’Shaughnessy. His research focuses on binary black hole parameter estimation and numerical relativity predictions for gravitational waves. Monica Rizzo, undergraduate student physics in the College of Science. Rizzo works with O’Shaughnessy. Her research estimates the tidal deformability of neutron stars. Jam Sadiq, Ph.D. student in the astrophysical sciences and technology program in the College of Science. Sadiq, a graduate Fulbright student, works with Yosef Zlochower, a founding member of the center, associate professor in the School of Mathematical Sciences and faculty in astrophysical sciences and technology Ph.D. program in the College of Science. Sadiq’s research explores general relativity and black holes. Zach Silberman, Ph.D. student in the astrophysical sciences and technology program in the College of Science. Silberman works with Josh Faber, member of the center, associate professor in the School of Mathematical Sciences and faculty in astrophysical sciences and technology Ph.D. program in the College of Science. His research explores ways to handle magnetic fields in simulations of binary black hole systems. Yuanhao (Harry) Zhang, Ph.D. student in the astrophysical sciences and technology program in the College of Science. Zhang works in gravitational wave data analysis with John Whelan.